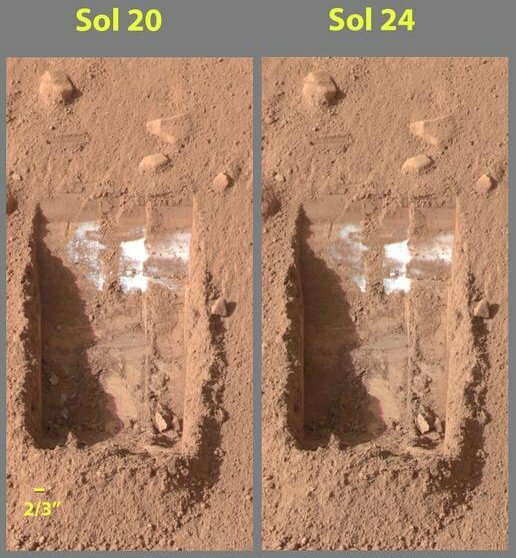 The images, captured by the lander's Surface Stereo Imager, show the disappearance of lumps in the bottom left of the trench, dubbed "Dodo-Goldilocks". Ray Arvidson, the mission's lead scientist for digging activities, said: "If they're ice deposits, they should disappear because water ice is not stable on the surface of Mars at that latitude.... And it's gone. It's disappeared. As soon as the sun hit that material, it disappeared. It's ice. This is why we went, so it's pretty exciting."